The Russian ruble lost 5 percent on Tuesday on the second day of post-holiday trading on the Moscow Stock Exchange. Sliding oil prices, which dropped below $50 per barrel on Monday, continue to weigh on the currency. The ruble lost 5 percent against the dollar, trading above 64 rubles midday, before settling to just below 62.9 at 6:00pm in Moscow. 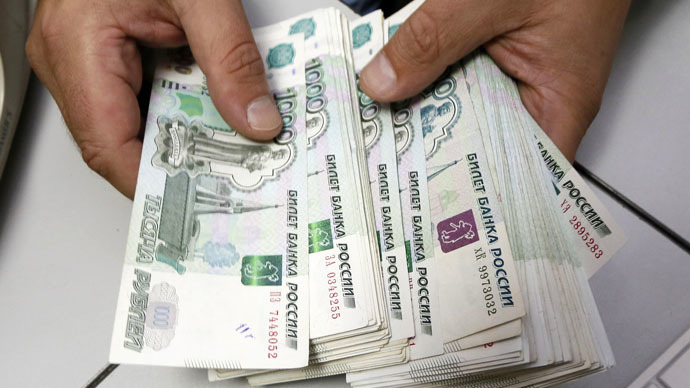 The ruble has already lost about 8 percent to the US dollar in 2015. The ruble also suffered a loss against the euro, losing more than 5 percent at 76.32 at 1:30pm in Moscow. Equities and indices were mixed, as the ruble-based Micex index gained 2.4 percent and the dollar-denominated RTS index dropped 4.3 percent. Brent crude dropped below $52 per barrel on Tuesday after a WTI slide to $50 per barrel for the first time in nearly six years on Monday. Six months ago, at peak oil values, it was trading for more than double today’s price. The oil-price sensitive ruble has tumbled in tandem with other prices, which have both lost about 50 percent in 2014. Oil is Russia’s main export earner, as well as contributor to the national budget. The Ministry of Economy has had to slash their 2015 oil forecast from $100 per barrel down to $80 per barrel. Urals crude, Russia’s key export blend, usually trades slightly lower than Brent. In the worst case scenario, the Russian economy will contract by 4.5 percent in 2014, according to the Central Bank. Last month, the Central Bank hiked the main lending interest rate to 17 percent in an effort to stem the ruble’s dramatic slide. The Bank has also already burned through more than $80 billion in foreign currency reserves trying to prop up the ruble. Neither tactic has managed to calm investor worries over the geopolitical situation between Russia and Ukraine, which led to Western sanctions against many Russian banks. More than $120 billion in capital is thought to have left Russia in 2014. The plight of the ruble has spread beyond Russian borders, especially to neighboring countries that have close economic ties with Moscow. On Monday, both Belarus and Turkmenistan devalued domestic currencies in response to the decline of the Russian ruble.